Home Magazine Lifestyle	What are Bauhaus watches? Nomos, Junghans, Patek Philippe – these three manufacturers and several more have Bauhaus watches in their collections. The Nomos Tangente and Junghans Max Bill are two of the most famous Bauhaus watches. But what is it that makes a timepiece a Bauhaus watch? The Bauhaus watch is undoubtedly one of the most beloved watch types. If you look into the history of Bauhaus, you start to understand some of the more famous Bauhaus models. The story begins in 1919, the year Walter Gropius founded the Staatliche Bauhaus in Weimar, Germany. This modern art school sought to unite art and craft. The school’s founding manifesto included statements such as, “The ultimate goal of any art is the structure!” and “Architects, sculptors, painters, we must return to craft!” Gropius identified with the ideas of the Deutscher Werkbund (German Association of Craftsmen), which was founded in 1907 and is considered one of the movements that served as inspiration for the Bauhaus. Six years after it was founded, the Bauhaus moved to Dessau. This was largely a political move, as nationalistic attacks on the school were on the rise. The term Bauhaus was inspired by medieval builder’s huts, which served as gathering places for groups of craftsmen to build cathedrals. However, the Bauhaus had nothing to do with sacred architecture – functionality was at the forefront of the movement. Gropius put it as follows, “Beauty can only arise from the complete harmony of technical function and proportional form.” The well-known motto form follows function accurately depicts a philosophy of the school. The somewhat radical ideas of the Bauhaus supporters were not undisputed at the start of the 1920s. When the National Socialist Party came to power in 1933, the art school was rapidly dismantled; however, numerous artists fled to Western Europe or America and continued to spread the ideas. Today, Bauhaus is considered one of the most influential art movements of the 20th century and has managed to also leave its mark on the watch industry. The Junghans Max Bill is a classic piece from Junghans, a watch manufacturer based in Schramberg in Germany’s Black Forest. The Max Bill has been part of the company’s collection since 1961. In the early 1950s, the traditional manufacturer commissioned the Swiss artist, architect, and product designer Max Bill to design a kitchen clock. Bill was born in 1908, studied at the Bauhaus in Dessau, and helped found the Ulm School of Design. Together with his students, Bill developed the famous Junghans kitchen clock, which later served as the template for the wristwatch. The Junghans Max Bill watch is characterized by a flat case with a narrow bezel, domed glass, and short lugs. The dial features filigree indices, and on some models, every fifth minute marker is longer. There are other versions that feature Arabic numerals and shorter indices. Dials are available in silver, anthracite, or black. The long and narrow hour, minute, and second hands suit the overall minimalist look of the Junghans Max Bill. Junghans relies on robust and proven ETA calibers for their watches. The Max Bill is powered by the J805.1 caliber. This movement is based on the ETA 2801-2 and has a power reserve of 42 hours. The automatic version of the watch with a date display features the J800.1 caliber, which is based on the widely-used ETA 2824-2. The chronograph version of the watch is powered by the ETA Valjoux 7750 – the most used chronograph caliber in the world. 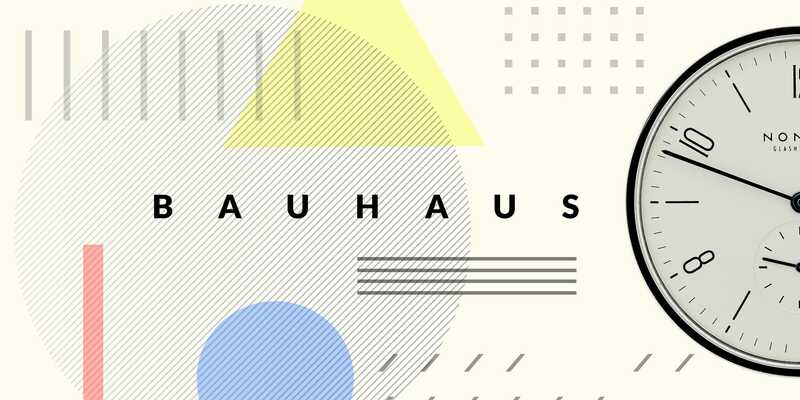 Most people think of sleek, straightforward, and minimalist designs when they hear Bauhaus. Bright dials, Arabic numerals, and thin indices and hands characterize most Bauhaus watches. Such is the case with the Nomos Tangente, a watch that has been available since 1992. The Tangente is one of the Glasshütte-based manufacturer’s original four models and has since become an icon of modern watch design. It is without a doubt the most well-known Nomos watch. The Tangente is characterized by a clean dial featuring alternating Arabic numerals and narrow indices. The minute track also makes use of fine line indices. The long, narrow hour and minute hands, as well as the thin small seconds hand at 6 o’clock are additional key features of the Tangente. The slim, angled lugs likewise mark the iconic look of this Bauhaus-style watch. There are many options available when it comes to case size, dial color, and movements. The classic 35-mm or modern 41-mm Tangentes are available with a white, champagne, or dark blue dial. Nomos equips the Tangente models with flat manual-winding or automatic movements. Highlights include the DUW 3001 and DUW 6101 Neomatik calibers, both of which feature the in-house Nomos Swing System. Nomos is introducing a limited edition Tangente to celebrate the 100th anniversary of Bauhaus. Each model in the series will be limited to 100 pieces. The dial on every model is the color of sketch paper and each features a yellow, blue, or red dial surround. These colors are reminiscent of the art school’s classic palettes depicting the theory of color. The stainless steel case back is embossed with the words “Tangente Sondermodell – Ein Jahrhundert Bauhaus” (Tangente Limited Edition – A Century of Bauhaus) as well as the piece’s number out of 100. The case is available with a diameter of 33 mm, 35 mm, or 38 mm. The manual-winding Alpha movement keeps the time for the limited edition models. The caliber is a Nomos classic, has a 43-hour power reserve, and is only 2.6 mm thick. A stop-seconds mechanism allows the wearer to set the time to the exact second. The Patek Philippe Calatrava is like a holy grail for many watch collectors and fans. Many view it as one of the archetypal dress watches that has influenced the style of this classic watch category. The first Calatrava, the ref. 96, was released in 1932 and took its name from the Patek Philippe company logo. At the time, the minimalist, streamlined design was considered modern and avant garde. The look of the Calatrava was strongly inspired by the Bauhaus movement. English watch designer David Penney is responsible for the Calatrava’s minimalist design. The Patek Philippe watch is characterized by domed watch glass, a flat polished bezel, and integrated lugs. The lugs are slightly arched so that the watch sits comfortably on the wrist. The dial is clear and tidy. The small seconds is located at 6 o’clock. Gold Dauphine hands point to trapezoidal applied gold indices to indicate the time. The design has attained cult status and serves as an example for other Patek Philippe models as well as watches from countless other manufacturers. Nearly every Bauhaus watch can be worn with a suit, but not every dress watch can be considered a Bauhaus watch. The models in the A.Lange & Söhne 1815 collection, for example, are all elegant, classic pieces, but rather reminiscent of pocket watches with their Arabic numerals and blued lance hands. The Jaeger-LeCoultre Reverso also has a classic look, but leans more towards an Art Deco style. The main feature of the Reverso is its reversible rectangular case. Bauhaus watches are simply elegant and embody the motto form follows function. Functionality is at the heart of these watches, which explains why the dials are kept streamlined and clean, making them easy to read.